For anyone setting up audio, video or otherwise stations out and about who wish to validate what they are capturing I've got an idea. I can't take credit as it's simply an adaption of something already used but here's my suggestion. IR beam alarms or similar set between trees etc (the sort which trigger/record when the beam is broken). Not sure if it's already being used or tried, just an idea. I'm intrigued by the various setups people use and discuss. The thing is, if someone gets wind of what you're doing they could easily just come and steal your gear. I wouldn't have enough faith in my fellow man to just leave a whole bunch of pricey electronic equipment in a publicly accessible location - I'd expect someone opportunistic (and ethically bankrupt) to steal it. I could imagine that this particular idea would work however, especially if you spread out your equipment to cover a wide area so as to increase your chances of getting something unusual on video. Not that I know what I'm talking about, never having done it, but Coast's idea does sound like a reasonable plan to me. Its a good idea. I'm not sure about the technicalities though of connecting the beams to a camera trigger. Would be very interesting though. 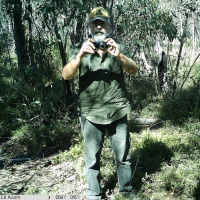 I've also been leaving cameras and recorders out since 2010 and never experienced theft even though I have captured people passing through in places I thought remote before. It's reassuring to know I'm wrong about the theft part. But yes, apart from Yowie finding expeditions, I'm sure lots of people access remote areas for all manner of reasons. Not that I can think of any offhand that aren't slightly nefarious...but this betrays my suspicious nature (yet again). Thanks guys. To clarify I don't mean to use the beams to trigger any other device (camera trap Style), only that crossing the beam would trigger it to make a record(somehow) and later that record could be checked. Perhaps the style that send an alarm back to base could be set up to record to USB? If you set a few beams at different heights you could easily check the recorded alarms and heights and then check the audio recorders or video camera. Would be great evidence to have audio recordings and a motion trigger on an 7-8 foot high beam!